Pulley Lagging for all styles and types of head, tail, snub, bends, take-ups and drives. Pulley lagging increases the traction between the belt and the pulley, which in turn reduces load and wear on the drive, belt, pulleys, bearings and take-up. Lagged in shop or in place on system. Extends the life – of key conveyor components. Reduces wear – from abrasive materials. 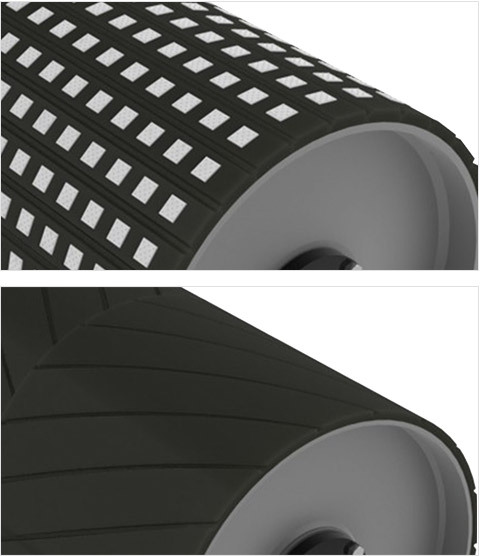 Prevents belt slippage – by increasing the coefficient of friction between the conveyor belt and the pulley. Creates a self-cleaning action – on the pulley surface and prevents the buildup of transported bulk material.